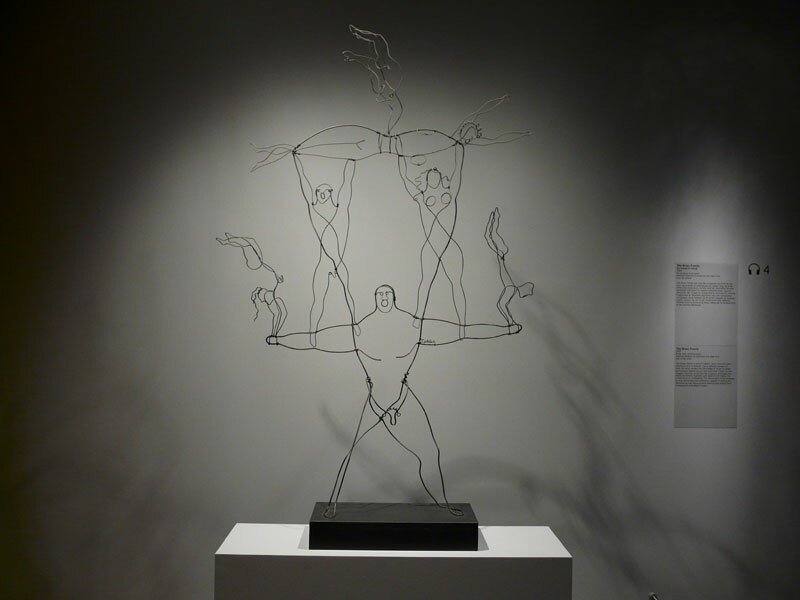 The Brass Family (1929) shows Alexander Calder’s deftness working with wire, his favourite medium. The subject—seven acrobats balancing—is taken from one of his enduring interests, the circus. THE HANGING mobile, its pieces tugged this way and that by the air, seems like it should have been around for centuries, if not millennia. Shakespeare ought to have mentioned it; an early example should have turned up in an Egyptian tomb. In fact, it didn’t come into being until the 20th century. In 1930 the American artist Alexander Calder (1898-1976) visited the Paris studio of Piet Mondrian. Calder recalled that the “shock” of seeing Mondrian’s coloured cardboard rectangles on white, light-filled walls gave him a “sense of floating.” He tried to sell the Dutch abstractionist on making his shapes actually float, but was rebuffed—so he did it himself. The popularity of Calder’s mobile in art circles peaked in the 1950s; by the 1980s it had been largely relegated to the role of baby soother over a crib. Lately, though, Calder’s stock has been rising. A Tate Modern retrospective opened in London in November 2014, focusing on his kinetic art. The new show at the Montreal Museum of Fine Art, which runs until 24 February 2019, is called Radical Inventor and covers not just his mobiles but his paintings, jewellery, sculptures and “stabiles”—large-scale mobiles that don’t move. One of the biggest was done for Montréal’s Expo 67. Then there is the “mini-circus”: a mélange of tiny trapeze artists, clowns and performing animals that he manipulated by hand before audiences, like a puppeteer working in front of the curtain. A film of him performing his Cirque Calder shows how singular it was. His Parisian shows brought him into the avant-garde art circles that led to the creation of his mobiles. And finally there is the artist’s story itself: the son and grandson of sculptors, Calder at first eschewed art and took a degree in mechanical engineering, then held various jobs before enrolling in art college. It was his work as an illustrator for the National Police Gazette that first exposed him to the circus, which led to his Cirque Calder , which took him to Paris, which led to the mobile. For those unable to make the Montréal dates, Alexander Calder: Radical Inventor transfers to the National Gallery of Victoria in Melbourne from 5 April to 4 August 2019. For more information on Alexander Calder: Radical Inventor at the Montreal Museum of Fine Arts (Musée des beaux-arts de Montréal) visit www.mbam.qc.ca. For information on Montréal visit the Tourisme Montréal website at www.mtl.org.